Cosmonauts Malenchenko (left) and Volkov prepare to explore the mysteries just outside their door. Last Wednesday, cosmonauts Yuri Malenchenko and Sergei Volkov pulled off a textbook E.V.A. (extravehicular activity...a.k.a. spacewalk.) 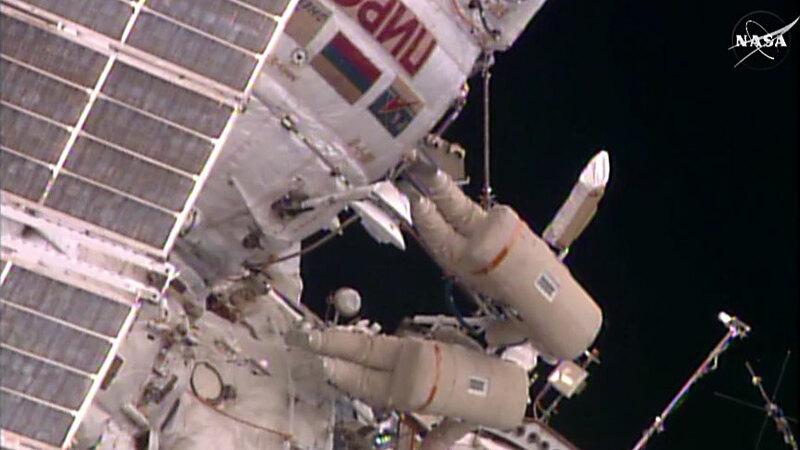 In 4 hours and 45 minutes, the cosmonauts obtained various scientific samples from the station's exterior, photographed the exterior to check for any issues, swapped out research payloads, installed new handles for future spacewalkers, and tested out a new tool that uses adhesive to apply special coverings to the station's exterior. One research payload, Europe's EXPOSE-R, contained 46 species of bacteria, fungi, and anthropods, all of which were intentionally left outside the station to see what would happen. This experiment is part of an investigation into the origins of life on earth, and assesses the viability of the various organisms in an extreme space environment. Some of the compartments were even designed to mimic life on Mars, so that we may better understand what will thrive effectively there when we eventually take a spin up to the red planet. Scientific business as usual: the cosmonauts check the station's status from the outside. The E.V.A. was the 193rd spacewalk conducted in support of the station's maintenance and scientific progress, which has so far required 1,204 hours and 45 minutes of free-floating human efforts since its inception in 1998. In other news, astronaut Scott Kelly worked with the prototype 3D printer aboard the station. Should this device prove successful at printing useful parts for the ISS, a larger and more permanent version will be considered for installation. Kelly also replaced fuel equipment in the Combustion Integrated Rack, which allows the astronauts to safely set things on fire (for science!) aboard the station. NASA astronaut Tim Kopra stored trash in an Orbital ATK vehicle bound back for Earth, and also assessed various pistol-grip tools for their capabilities during spacewalks. ESA astronaut Tim Peake took samples of water from various station taps. The samples will be sent back to Earth for analysis of the station's continued capable functions. Peake also worked on maintenance for the BioLab incubator, and even had some time to catch a rugby game. And of course, astronaut Scott Kelly found some time to capture some stunning snaps of Earth from his micro-gravitational perch. Morning in Australia, night on the ISS. "Day 312. 5,000 times around Earth can seem like Groundhog Day, but it's still a privilege." Don't forget, Earthlings, you can shoot pictures of the ISS right back! Just check out NASA's Spot The Station website to learn exactly when the ISS will do a flyby of your area. Leave your lens open for a long exposure of the station's transit, or bust out the zoom lens and see how much detail you can discern from the coolest craft in orbit! That's all for this week, space fans! We'll see you next Sunday with even more awesomeness from orbit. Watch this space! This may be an image of Earthrise, but still, Happy Lunar New Year!